A desk is a desk, right? Simple question, really. No it’s not! Just think about your own home – we’ll hazard a guess here and state that there are at the very least two or three different types of desks in your house or flat at this very moment. If nothing else, you’ll have some kind of dining table and either a dedicated office desk, a writing desk, or some type of desk where you have your computer and/or study and work stuff set up. 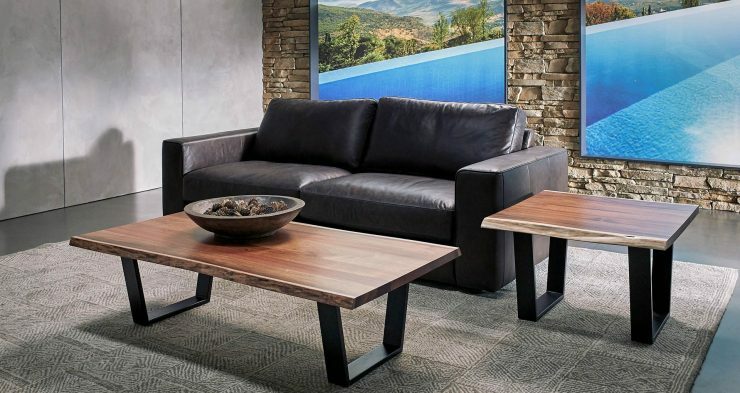 It’s quite possible that there’s a coffee table as well. And that, really, only scratches the surface. 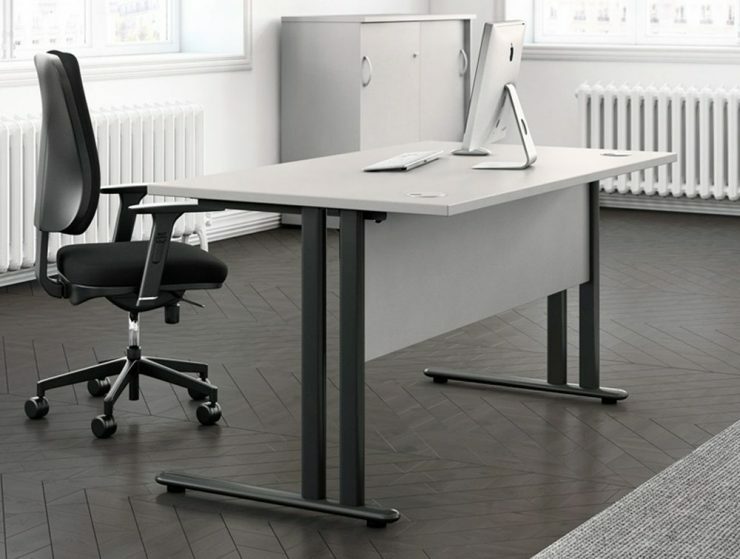 Desks, as simple as the concept in itself is, are one of the most versatile, most diverse items of furniture, and we really doubt that you know even a single person that could truthfully say that they do not own a table. They come in a variety of sizes and shapes, and are either incredibly adaptable when it comes to what you intend them to use for, or are highly adjusted to their intended purpose. And since, as we have already pointed out, everybody needs to purchase at least one desk or table at some point in their life, we have drawn up a brief survey of the most commonly encountered types of desks, how to differentiate them, and which purpose they are built for (if applicable) for you. A table used for seated people to eat meals. Usually functional and without drawers. Can be plain or with ornaments. Can double as writing, study, or computer table if there is no other designated room or furniture for these activities. 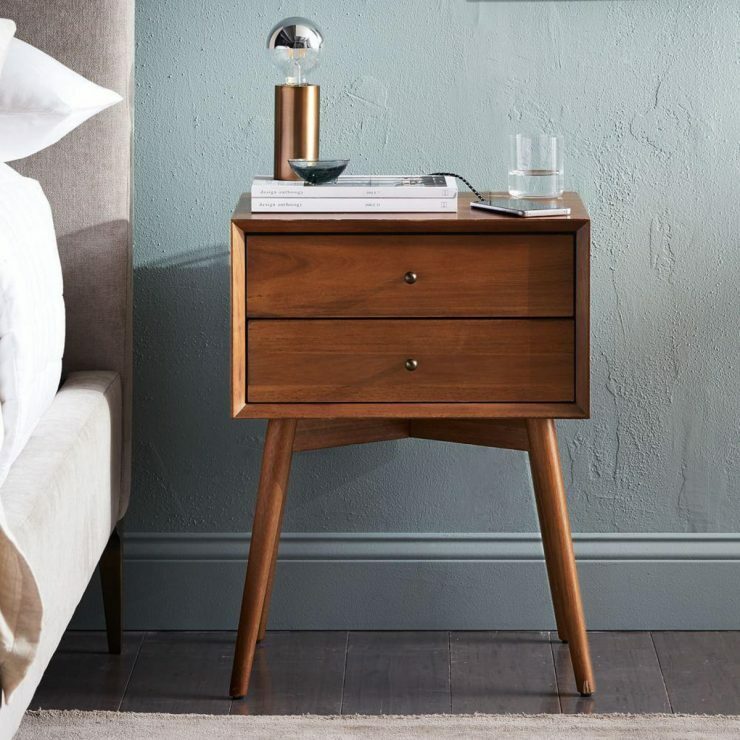 A simplistic table with little or no storage units/drawers but a wide desktop. Usually best suited to be placed against a wall. A low table used in living rooms, typically in front of a sofa, to hold magazines, remotes, and to hold snacks or refreshments. 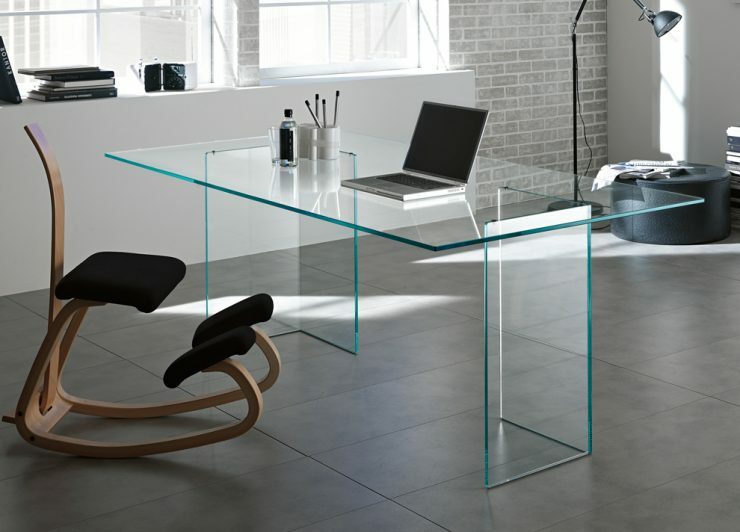 Any type of desk with a (tempered) glass desktop. 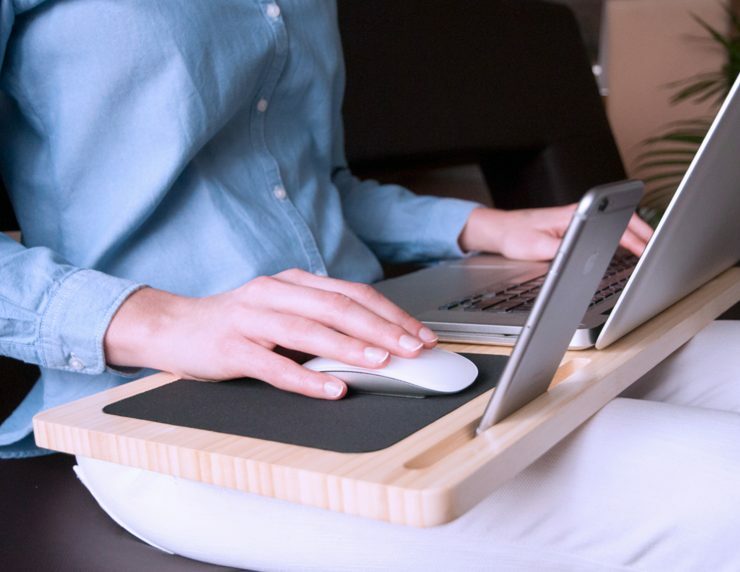 Can be a dining-, writing-, or coffee table. A very contemporary style of desk. Used in the bedroom to hold alarm clocks, reading material, lamp, and whatever else you might need or want to reach from the bed. 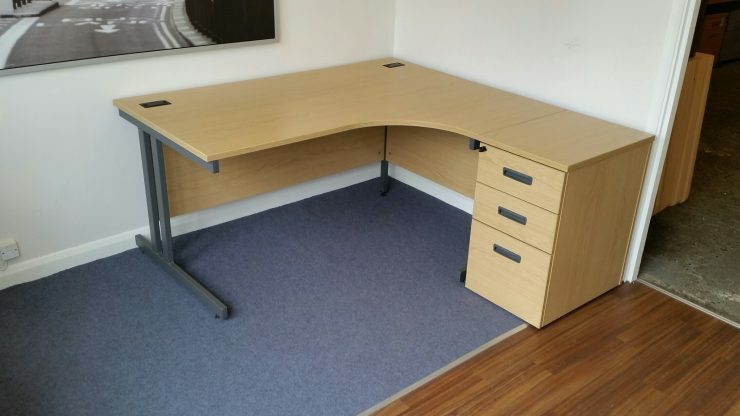 Simple, rectangular desks that typically come in size between 1.200mm x 800mm and 1.600mm x 800mm. The type of desks most commonly used in offices. Come with a ‘curved’ top (either extending out on the left or right side, depending on preference or placement) that creates a larger working surface. Often come with a small chest of drawers mounted on rolls for ease of movement. 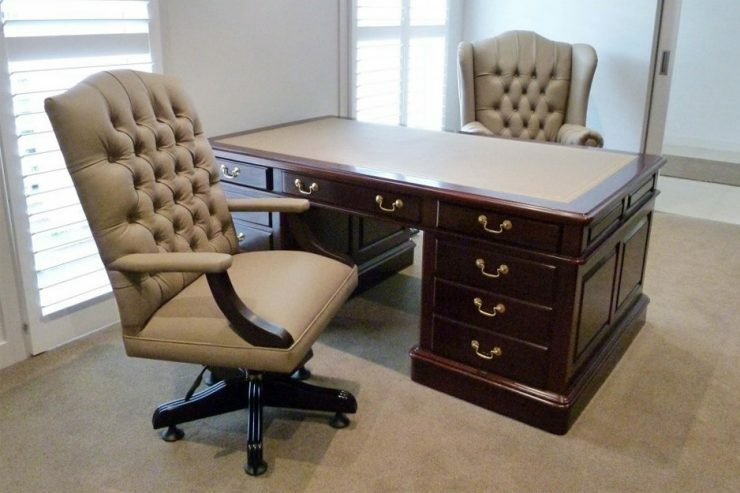 The high-end desk usually encountered in upper management offices. Typically sturdy, and intended to stand free for optimum effect. Typically come with luxurious finishes and can be quite ornate. Similar to radial/corner desks, though the extended shape is less pronounced and gives the desk more of a wave- instead of an ‘L’-form. A combination of a desk and a cupboard. 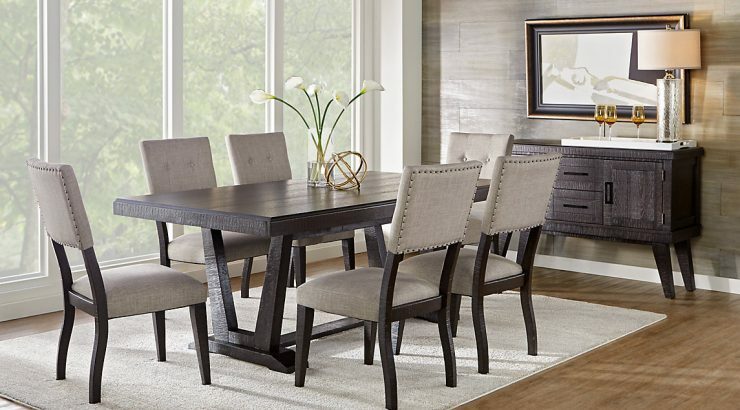 Typically found in living-rooms, sometimes in dining-rooms, thanks to its dual function. Essentially a group of desks that share the same frame. Typically encountered in open-plan offices or spaces where more than one person needs to work or study at the same time. Biggest benefits: they can be easily extended and necessities like cable management systems can be shared. Types of desks that can be adjusted in height (particularly well-suited for tall or handicapped persons), and can even be used standing up. They can be either very simple (flat-topped rectangular) or elaborate (slanted work-tops, screen mounts,…). 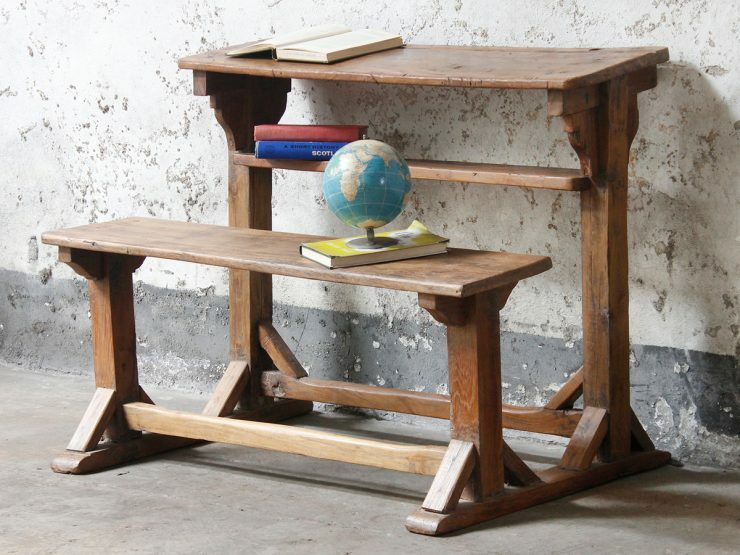 Basically, the modern trestle desk is a plank of wood set on two trestles. It is eminently portable, and eminently practical, when care is taken to provide stable trestles. Usually paired with short, rolling filing cabinets to create storage space. A classic, elegant design. 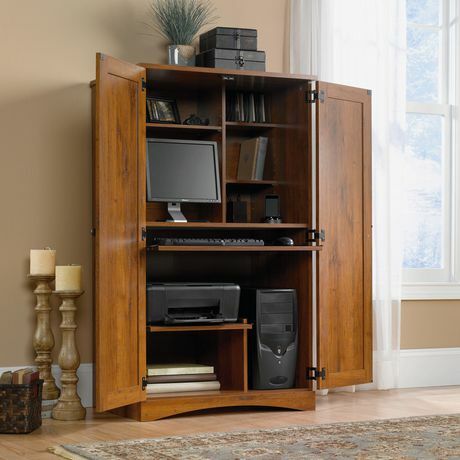 Made of a base of wide drawers topped by a desk with a hinged desktop surface, which is in turn topped by a bookcase usually closed with a pair of doors, often made of glass. 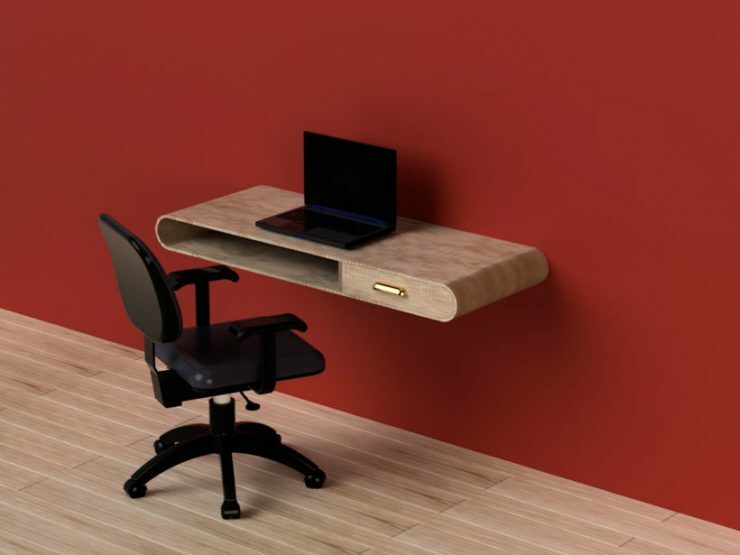 A kind of desk that’s directly installed on a wall and doesn’t rest on legs. Typically found in dorms or other rooms with limited space available. A beautiful piece of furniture with a series of stacked compartments, shelves, drawers and nooks mounted on top of the work-space. The desktop surface can be covered by linked wooden slats that roll or slide through slots in the raised sides of the desk. A writing-table built within a large cabinet, usually 1.5 to 2.0 metres (5–7 feet) high. 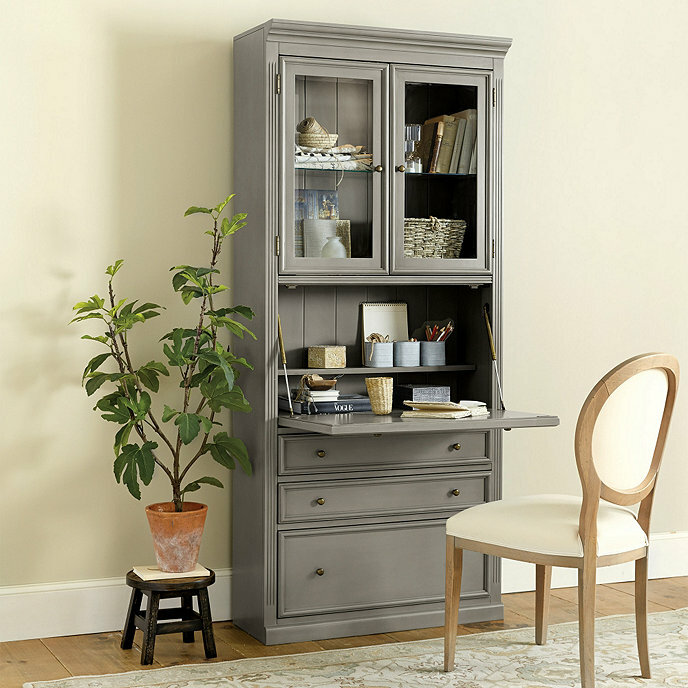 The cabinet is closed by full-height doors, to keep out dust or to hide the cluttered working surface of the desk. Usually placed against a wall. 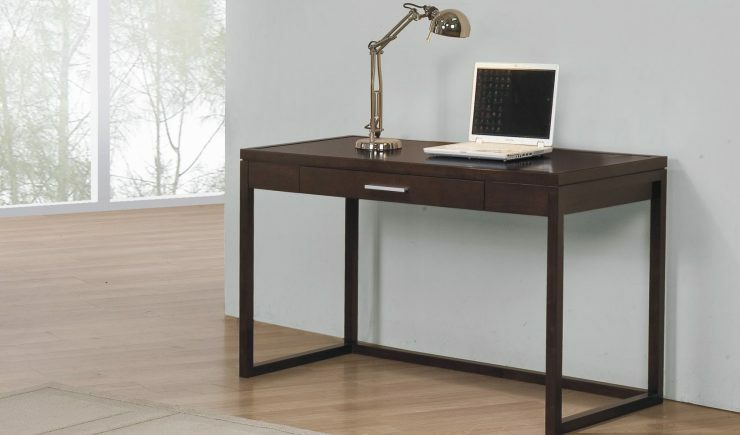 A small desk with inclined lifting desktop attached with hinges to the back of the body. Lifting the desktop accesses a large compartment with storage space for paper and other writing implements, and smaller spaces in the forms of small drawers and pigeonholes. 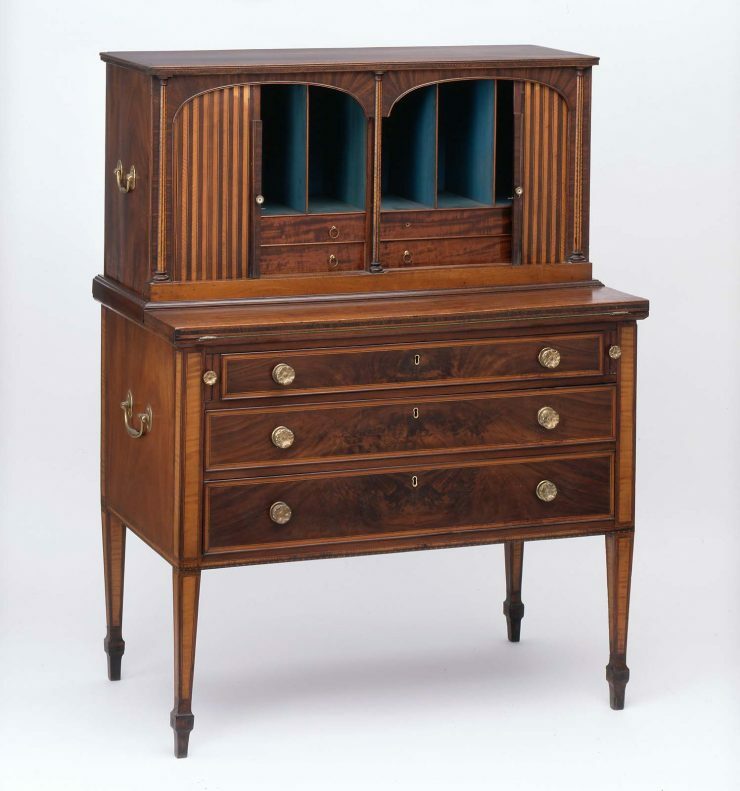 The Davenport has drawers on one of its sides, which are sometimes concealed by a panel. 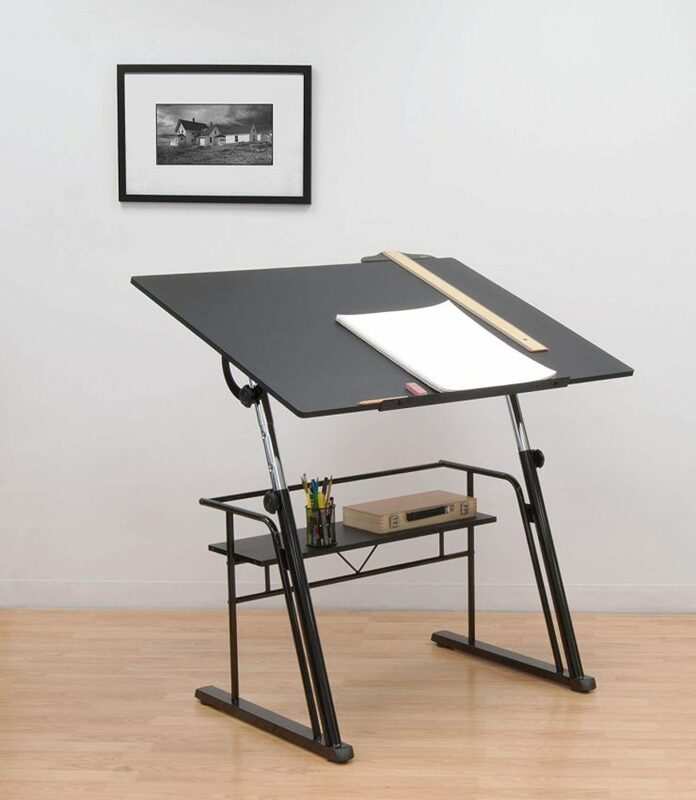 A multipurpose desk which can be used for any kind of drawing, writing or impromptu sketching on a large sheet of paper. Also used for reading large format books or oversized document, and -typically- for drafting precise technical illustrations (such as engineering or architectural drawings). Can also be used as a standing desk. 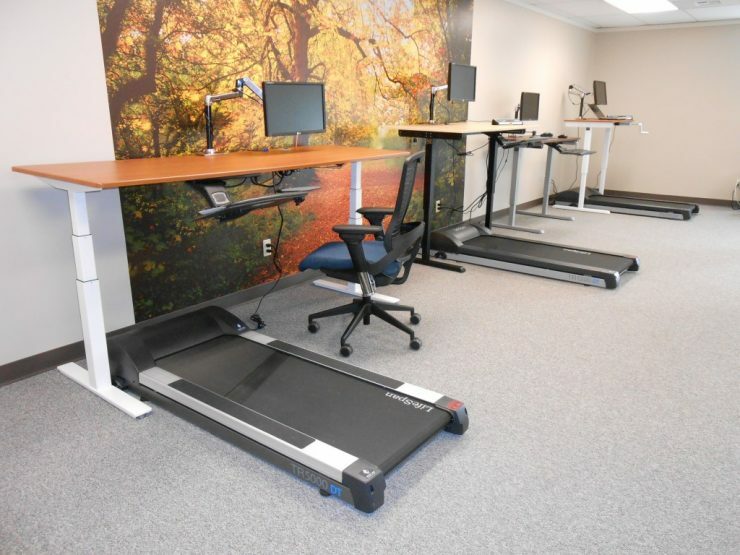 The combination of a standing desk and a treadmill. Often intended for use in bed or on a sofa. Can come with collapsible legs, or a cushioned bottom that is placed directly on the user’s legs/lap. Typically used as portable laptop ‘desk’ these days. Basically a secretary desk without the massive bookcase on top of it. Downside: all writing material must be removed from the desktop before closing the top. 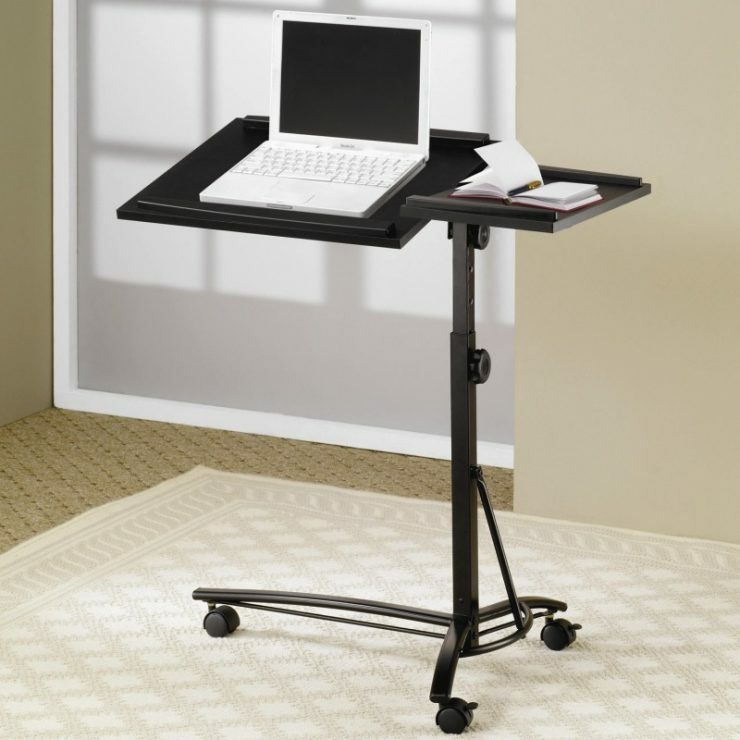 A kind of small, elevated desk top that’s typically used for holding notes while giving a speech or presentation. Can come with additional laptop or screen mount these days. A combination of chair and tablet surface, where a small desktop is mounted on one arm or side of a chair, typically on hinges for ease of use. Typically found in schools or a university setting in its barest forms. 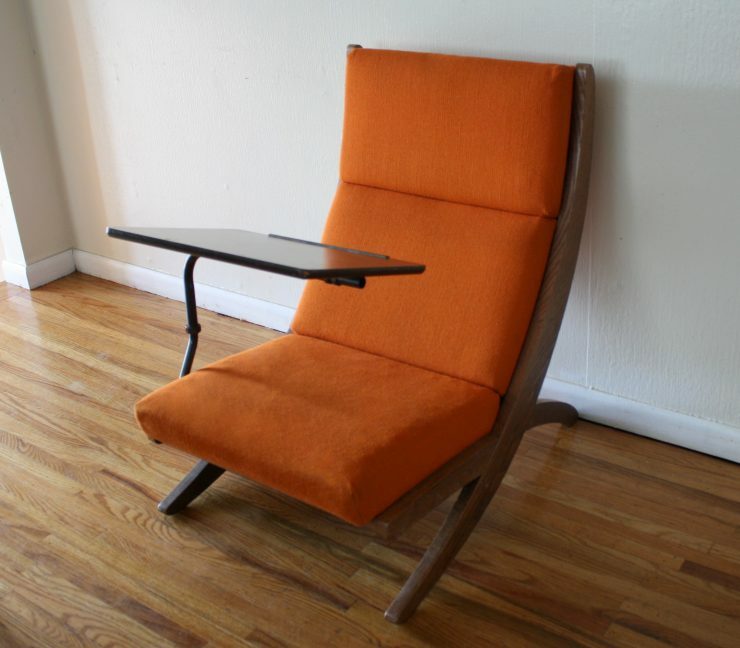 Makes for a comfortable note-taking or writing space in it’s more elaborate form: the writing armchair. Refers to two concepts: either a designated writing table with ample storage (drawers, pigeon holes, etc.) for writing implements and paper that also has the design of a game-board (e.g. 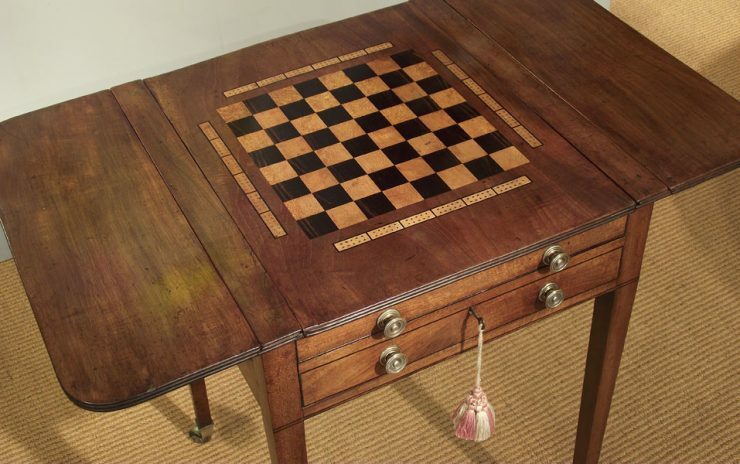 a chess board) etched onto the table top; or a designated table for playing games (often with a felt surface) that doesn’t support use as writing surface. A form of portable desk made up of two chests. Usually with drawers on the bottom one with a hinged desk surface on the top one. 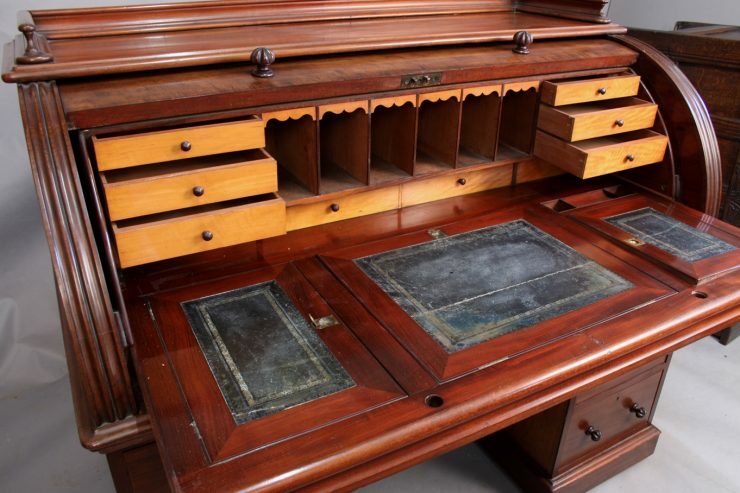 The interior of the desk is equipped with small drawers, pigeonholes, etc., for storing papers and supplies. Has also been used for sewing or as a jewel chest. 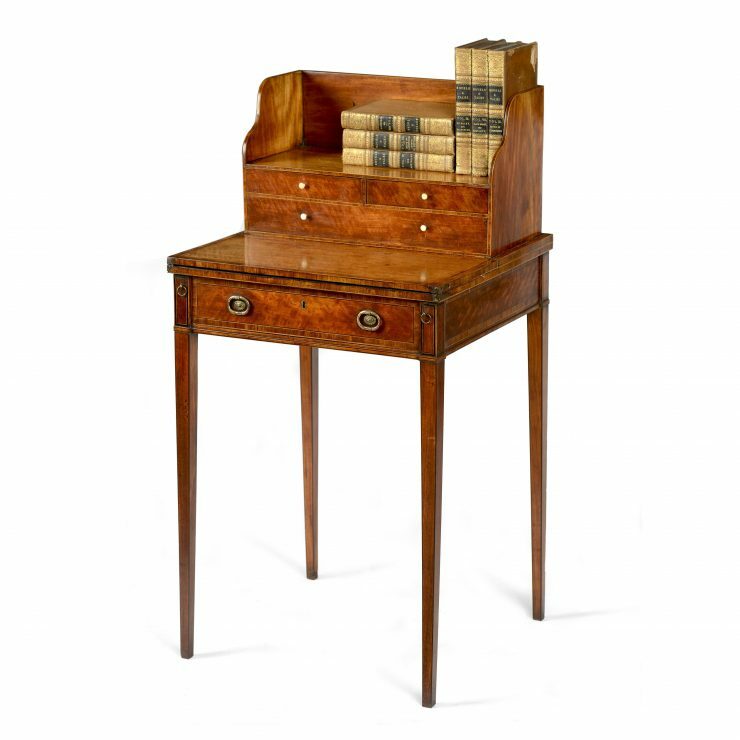 A type of lady’s writing desk. It is always very light and graceful, with a decorated back, since it often did not stand against the wall but was moved about the room. Its special characteristic is a raised back, which may form a little cabinet or a nest of drawers, or open shelves, which may be fitted with a mirror. Beneath the writing surface there is usually a single drawer, often fitted for toiletries or writing supplies. 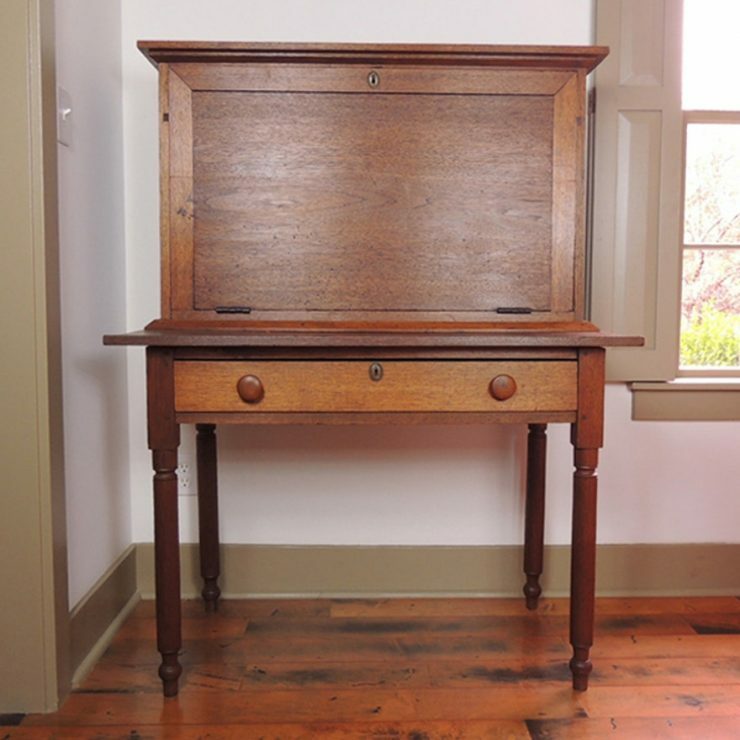 An antique desk form resembling a writing table with, in addition, one or several tiers of small drawers and pigeonholes built on part of the desktop surface. A 17th-century desk form and the earliest predecessor of the pedestal desk. It differs from it by having only two tiers of drawers or three tiers of rather small drawers under the desktop surface, followed by eight legs supporting the whole. Has cross braces between the legs, forming two Xs or two Hs on each side. Usually a kneehole desk, in that it is meant to be used sideways, with one knee only beneath the work surface. The rest of the space next to the knee often served as a lockable storage space. A piece of furniture designed for those in service to fine English houses to keep documents and records. It was eminently practical and based on the ever-growing needs of persons in service. The earliest form was a high desk for use by a standing person. It had many drawers of different size and had locks on both the drop front and individual drawers. 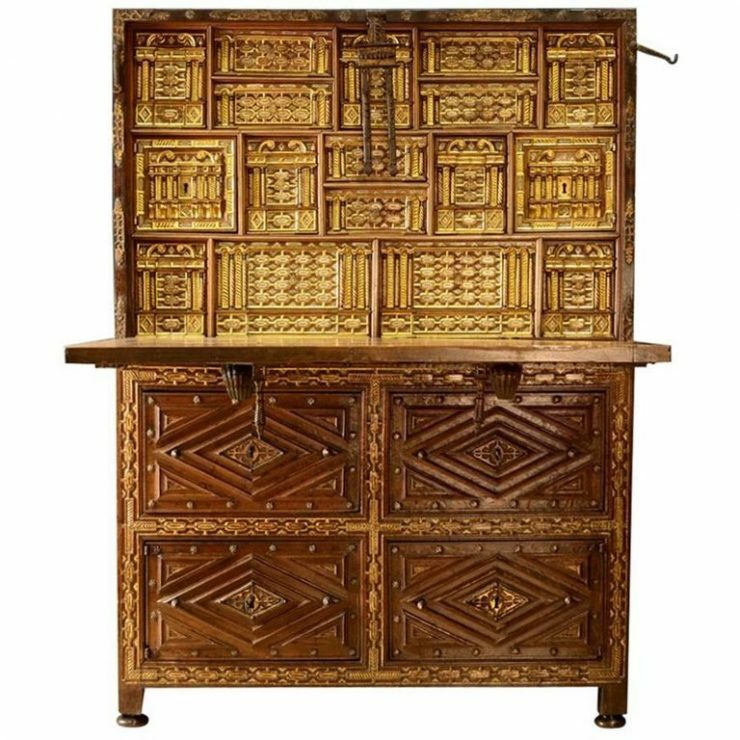 Many of these desks would have a secret compartment reserved for any important documents that were entrusted to the head butler by the master. 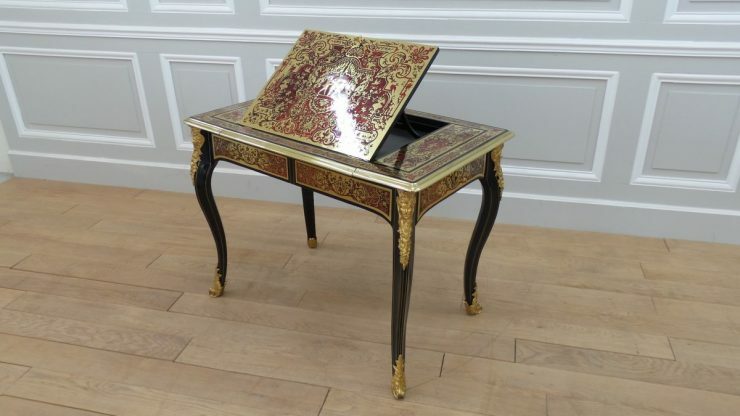 A specific antique desk type within the more general bureau à gradin form. Supposed to have been designed in the 18th century for the Prince of Wales (who later became George IV) and is named after Carlton House, which was at the time the London residence of the Prince. 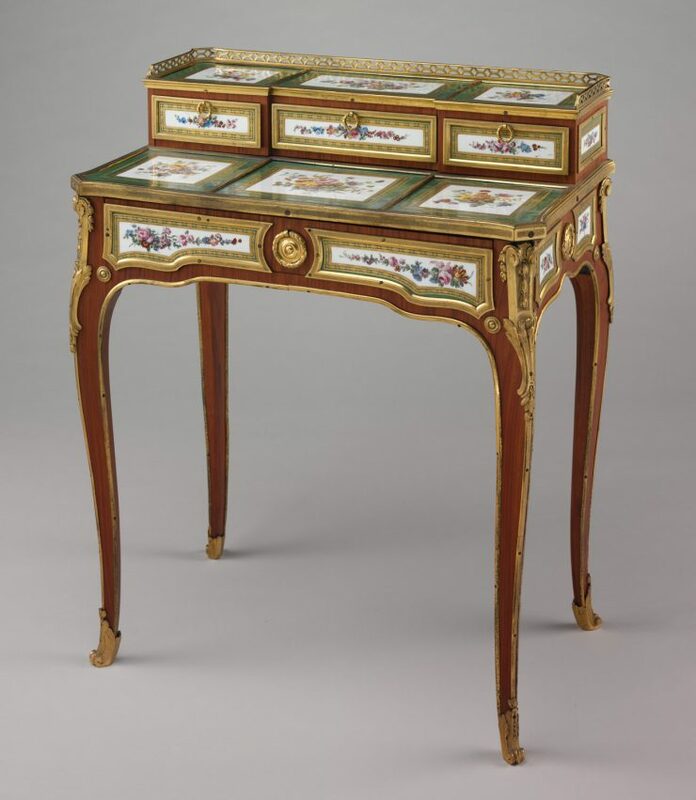 The desk resembles a normal writing table, but small drawers above the surface form a “U” shape around the user, instead of merely facing the user as in a typical bureau à gradin. There are usually small slopes over each of the desktop drawers at the left and right ends of the “U” shape. 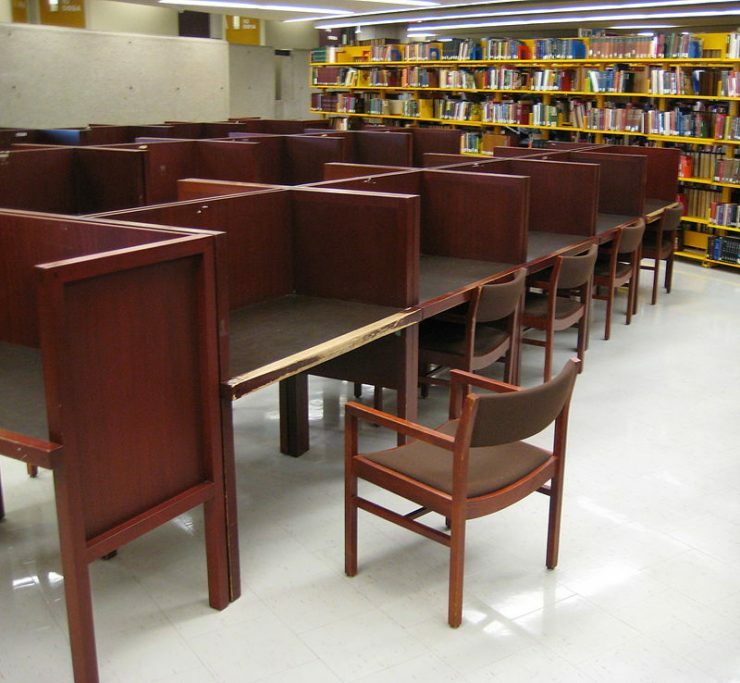 A carrel desk is a small desk (usually) featuring high sides meant to visually isolate its user from any surroundings either partially or totally. Often found in (university) libraries. 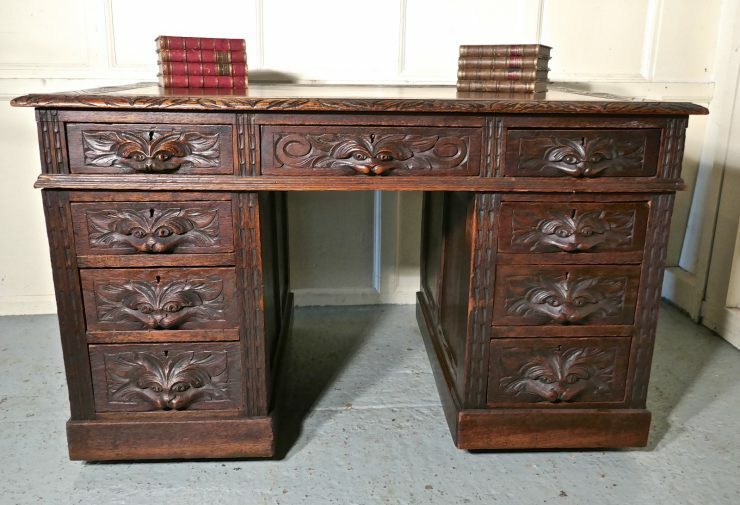 An antique desk of very small size which features a single drawer under the writing surface. It is also written with an “S”: Sheveret. Some variations are much taller and have one or two shelves built between the legs, under the main drawer and are meant to be used standing up. The cubicle desk, or -more commonly- cubicle, is a partially enclosed office workspace that is separated from neighboring workspaces by partitions that are usually 5–6 feet (1.5–1.8 m) tall. 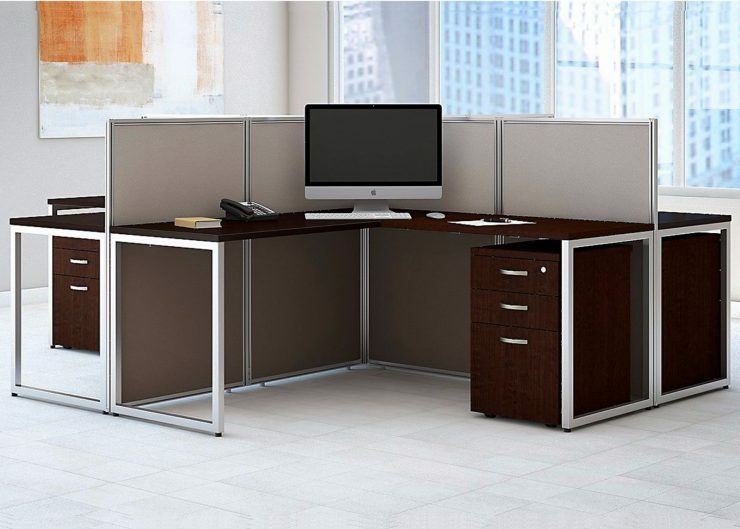 Cubicles are composed of modular elements such as walls, work surfaces, overhead bins, drawers, and shelving, which can be configured depending on the user’s needs. 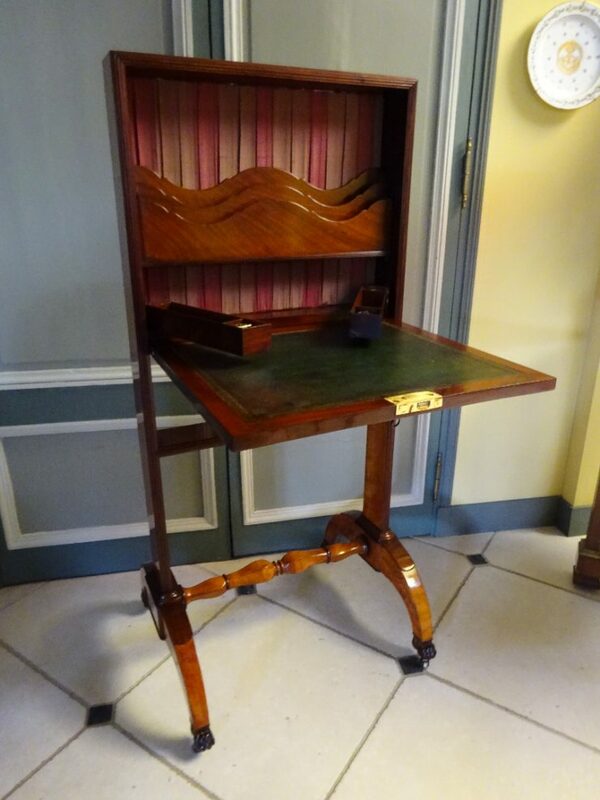 A desk that resembles a Bureau Mazarin or a writing table equipped with small stacked shelves in front of the user’s main work surface, and a revolving cylinder part that comes down to hide and lock up the working papers when the desk is not in use. It usually has a fixed work surface: the paperwork does not have to be stored before the desk is shut. 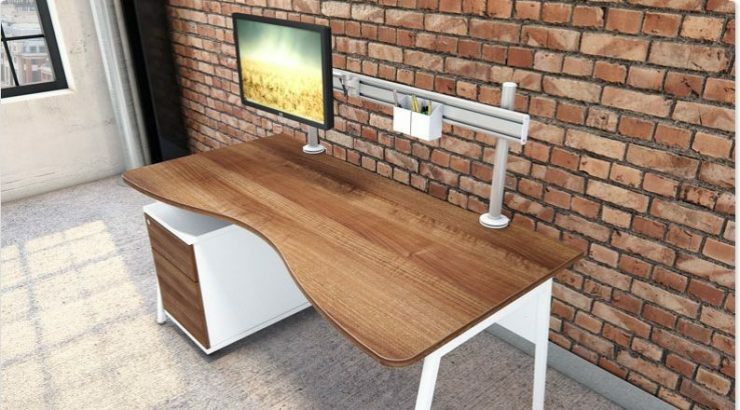 Some designs, however, have the capacity to slide the desk surface out a few inches to expand the available work area. A desk combined with a small bench or a stool made in exactly the same style and material. The desk is usually not very big and meant to be placed against a wall, in a little room or a hallway. Since the stool or bench has no back it is put away completely under the desk when not in use, maximising even more the available space. The desk is usually built with a single drawer or none, and the bench can sometimes have a small storage space under its seat. 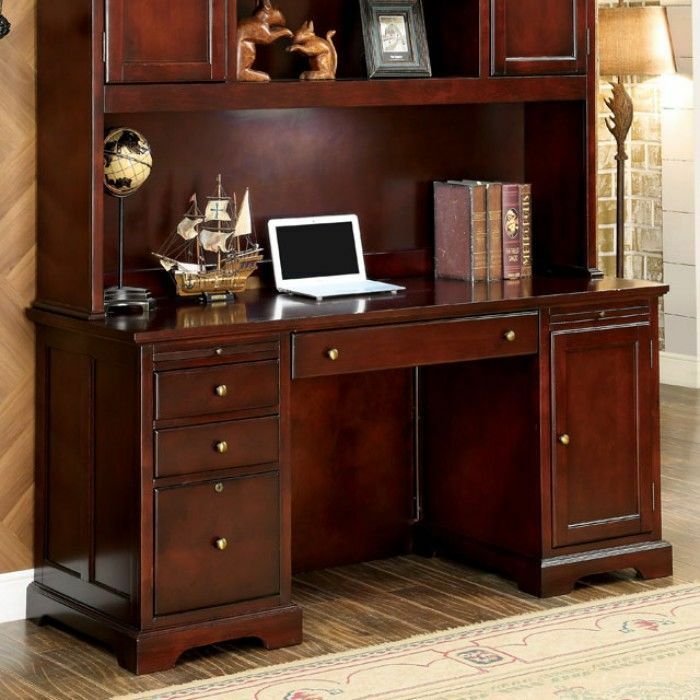 Can be considered the cousin of the secretary desk – both have a main working surface or desktop which does double duty as a cover to seal up papers and other items located in small shelves or small drawers placed one on top of the other in front of the user. Thus, all working papers, documents and other items have to be stored before the desk is closed. Unlike the secretary desk, the fall front desk’s desktop panel is in a perfectly vertical position when in its closed position. Often, there are no additional shelves or drawers above the section which is enclosed by the desktop. 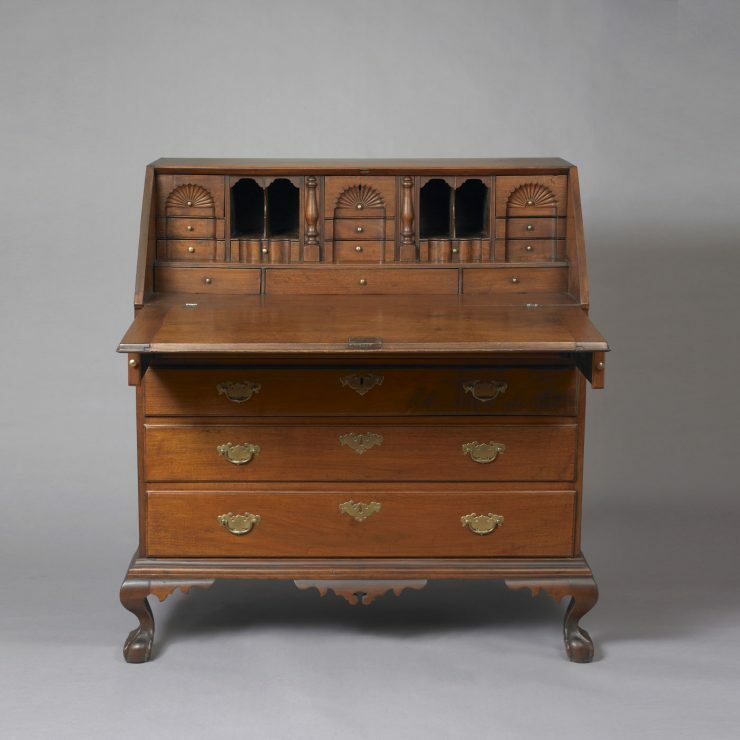 A very small antique desk meant to be placed in front of a fireplace to keep a user’s feet warm while he or she was stationary while writing. Was very popular in prosperous homes in Europe during the 18th century and slowly disappeared during the 19th, with the gradual introduction of stoves and central heating. 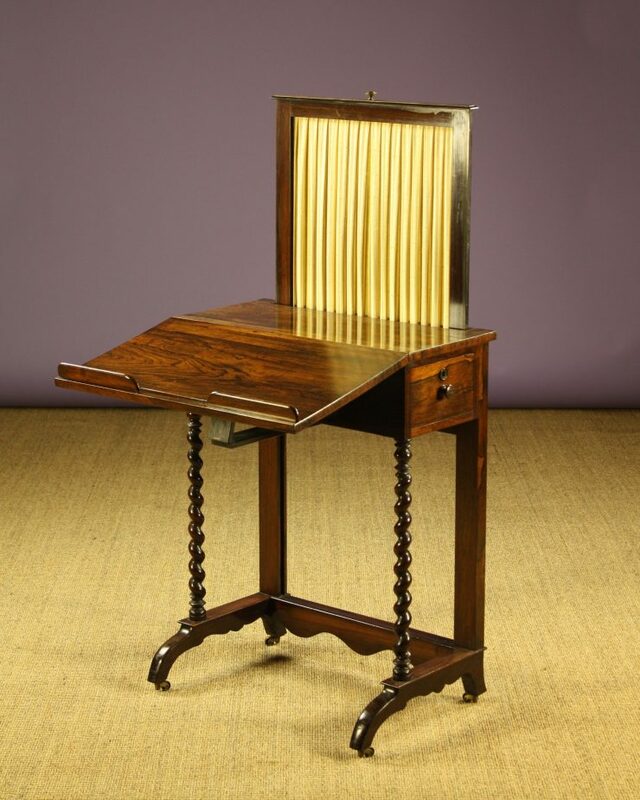 A medium-sized writing table with a small hinged panel in the middle which can spring up by the aid of a mechanism or be propped up at a desired angle to facilitate reading, or writing on its slanted surface. Many have lateral panels which swing out on both sides to give a larger desk surface. An antique desk type, which is basically two pedestal desks constructed as one large desk joined at the front, for two users working while facing each other. 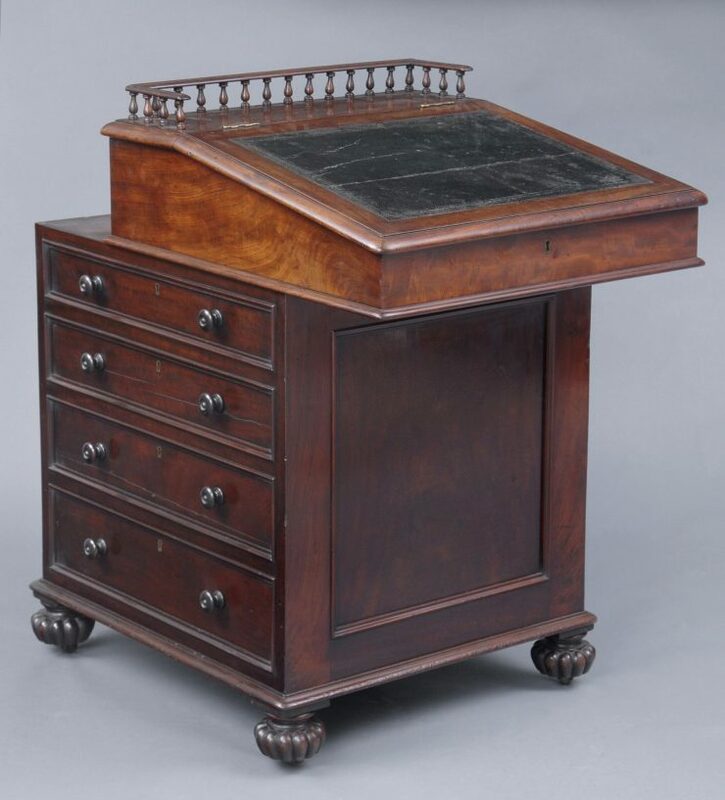 First conceived in the United Kingdom to accommodate the work of banking partners, they were an adaptation of the earlier and sometimes larger library desk. 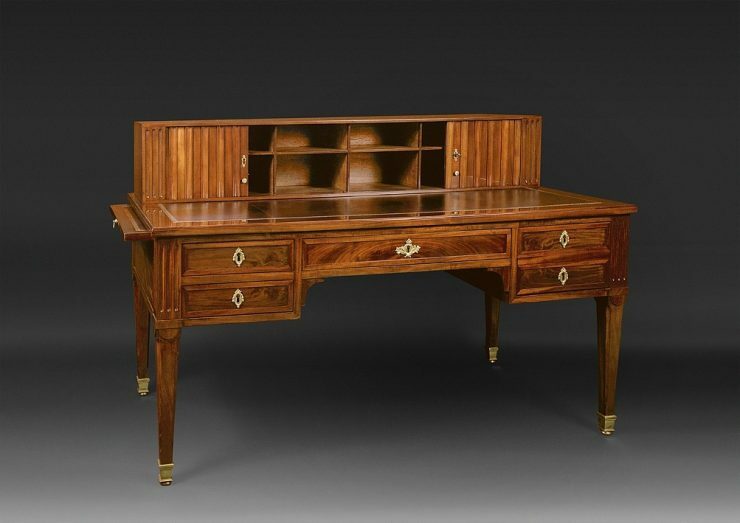 Most partners desks made in the 19th century were built of high quality woods such as oak, mahogany or walnut and finished with tooled leather inserts on top and brass fittings all around. Usually a large free-standing desk made of a simple rectangular working surface resting on two pedestals or small cabinets of stacked drawers of one or two sizes, with plinths around the bases. Often, there is also a central large drawer above the legs and knees of the user. 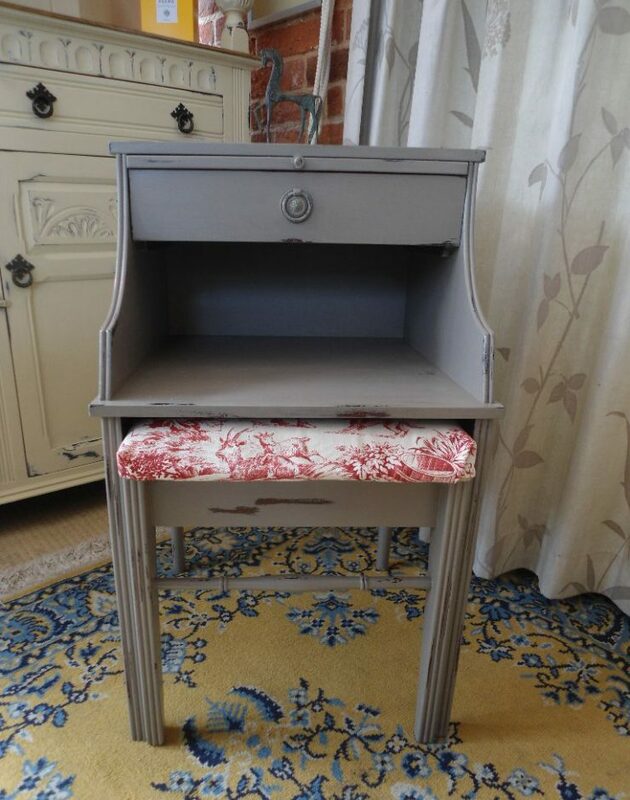 An antique desk form which is thought to have been originally used as a mail desk by postmen. It is known to have been used on Southern plantations in the United States, but it is not limited to them. 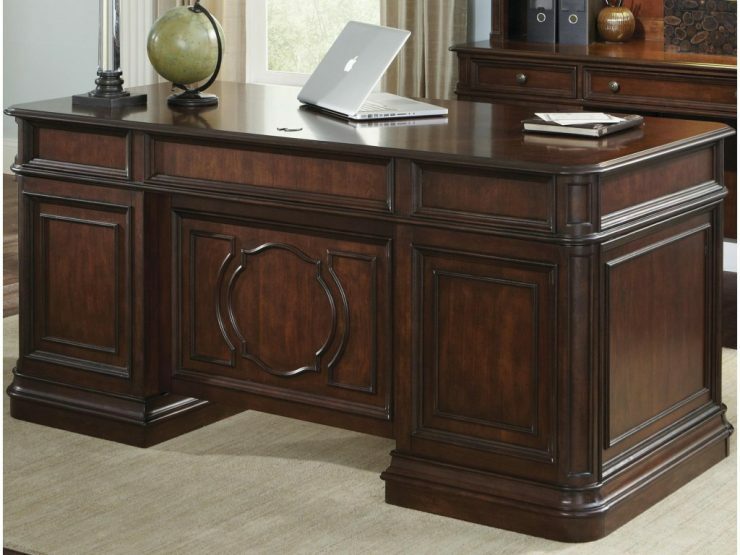 Basically, the Plantation desk is a fall-front desk with a deeper stand or bottom part. 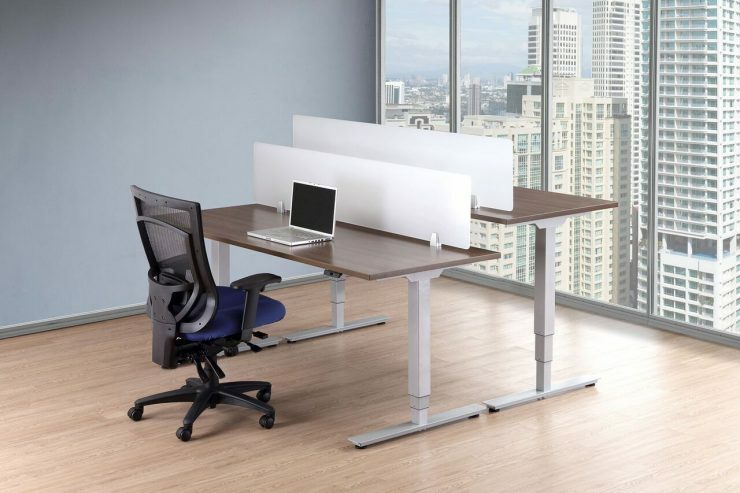 The extra space or ledge of the bottom part of the desk serves as a support for the fall front, thus eliminating the need for retractable supports. 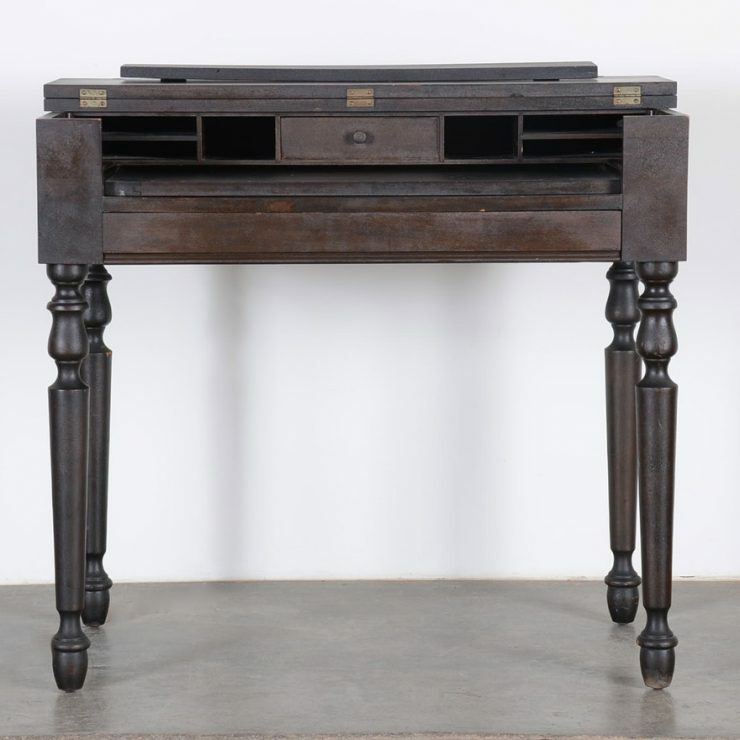 An antique type of desk which is usually mounted on rollers at the end of four jutting legs. The legs in turn support what appears as an oversize vertically mounted wooden pizza box. This is a cabinet a few inches thick, with barely enough space in it for the raised desktop surface and a few pens and sheets of paper disposed vertically. 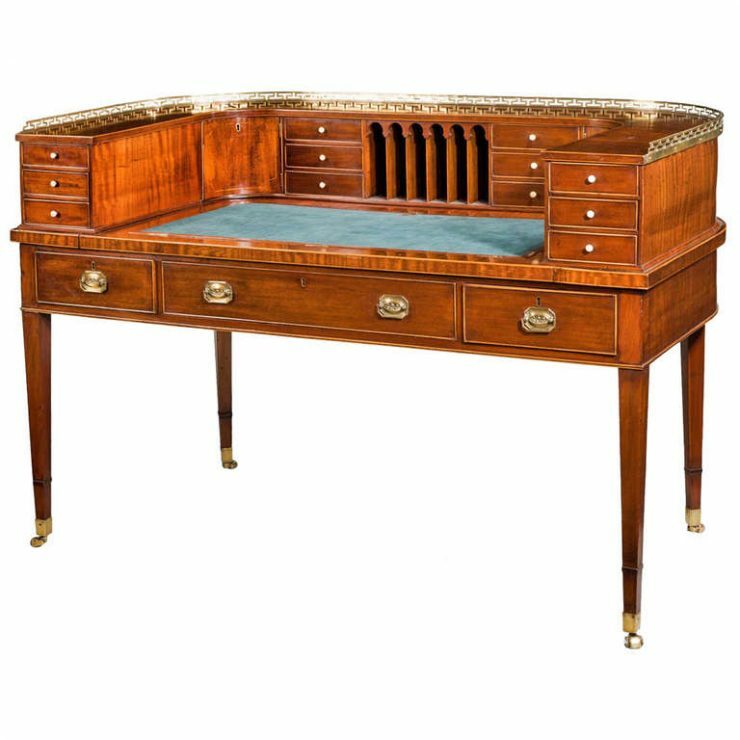 In short, the secretaire en portefeuille is much like a fall front desk which has been reduced in depth to a bare minimum. 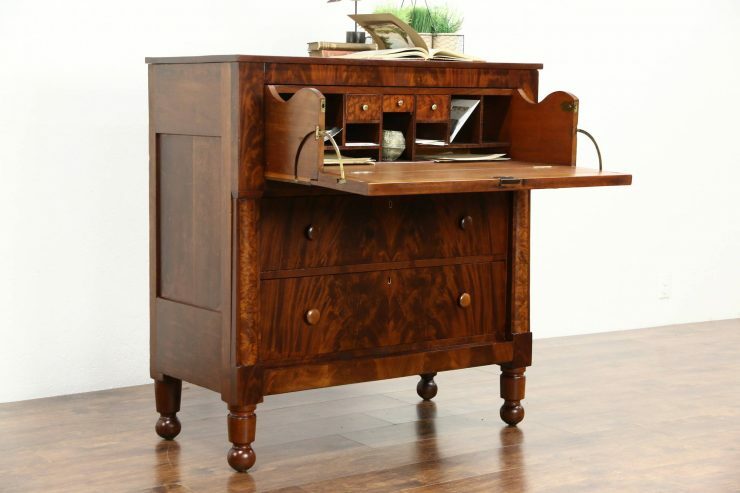 A desk shaped similar to a writing table. It is slightly higher and fitted with a single drawer under the whole length of the flat top surface. This single drawer, however, is a dummy. It is a hinged panel which is meant to be folded in, at the same time as half of the hinged top surface is folded back on to the top of the other half, revealing an inner desktop surface of normal height, with small drawers and pigeonholes in the back. 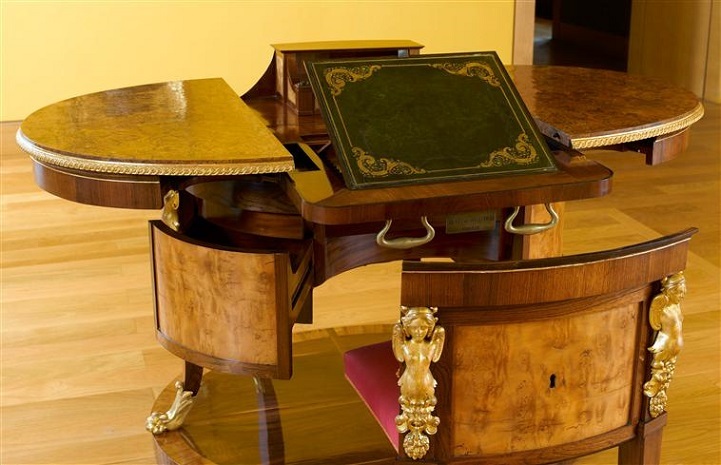 In certain spinet desks the inner desktop surface can be drawn out a few inches, adding working space. 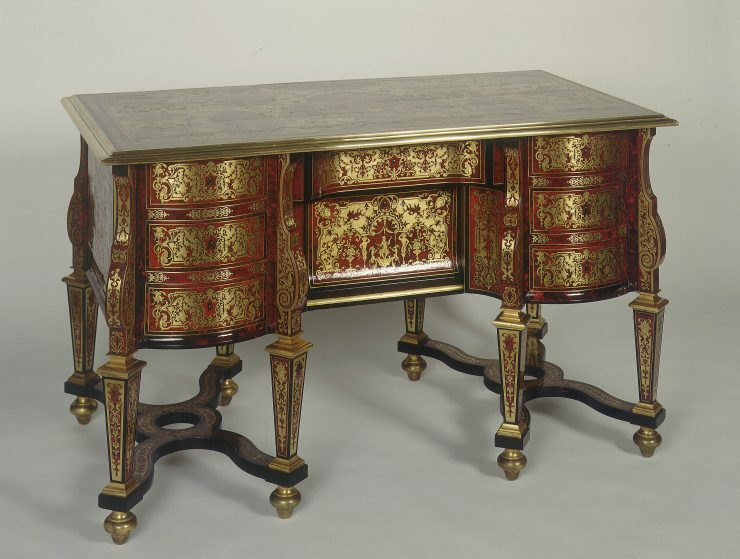 The spinet desk is so named because when closed it resembles a spinet, a musical instrument of the harpsichord family. 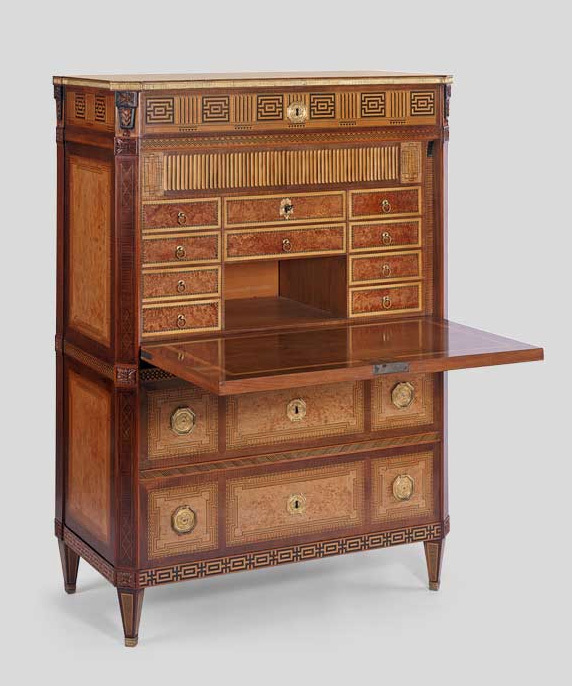 A desk with desktop-based drawers and pigeonholes, that resembles a bureau à gradin. The small drawers and nooks are covered, when required, by reeded or slatted shutters, tambours, which usually retract in the two sides, left and right. 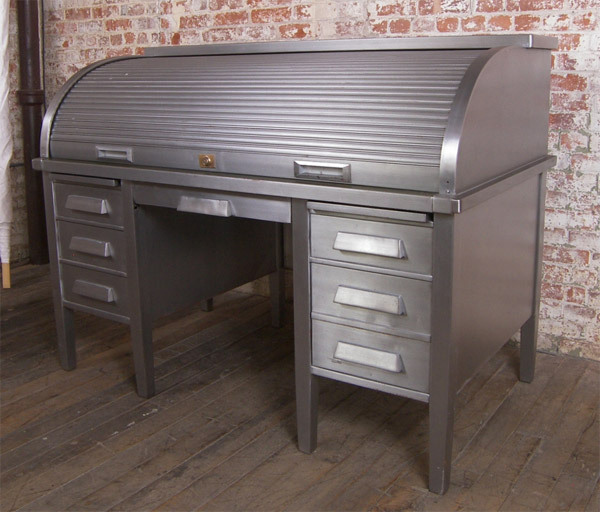 It is a flatter and “sideways” version of the roll-top desk. The smallest kind of fixed desk. Its traditional role is to provide a working surface barely large enough to write notes while speaking on the telephone, and in some cases to support the telephone or hold telephone books. In early generations of telephones the phone apparatus itself had a small desk built-in. This was most common in wall mounted telephones of the end of the 19th and the beginning of the 20th century. 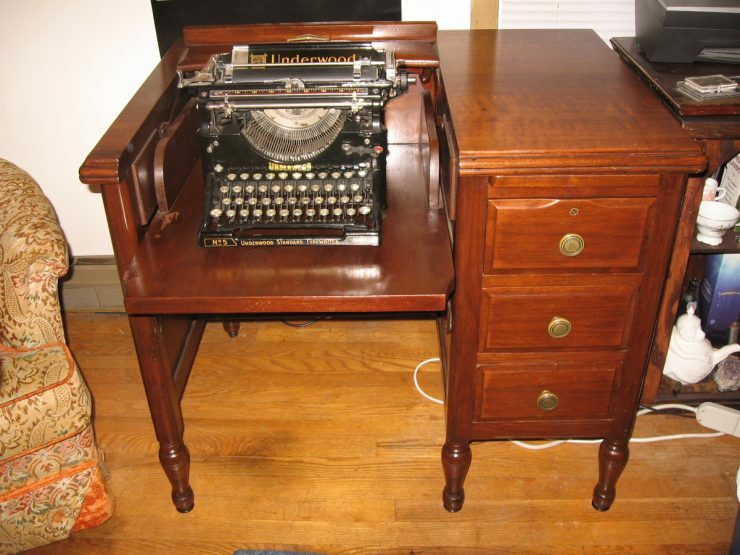 A desk meant to hold a typewriter at the proper height for the typist’s hands while still allowing a seat height that is low enough to be comfortable for the typist’s feet. 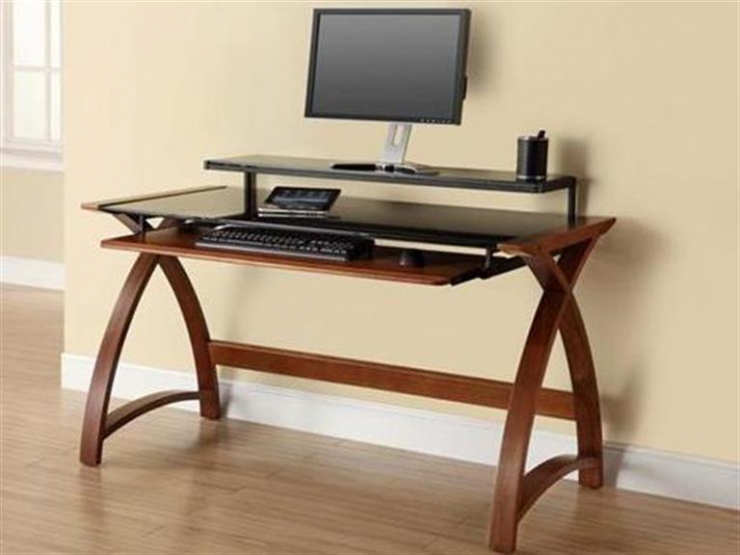 This height is usually a few inches lower than the 29 inch (73.7 cm) height of the traditional desk. Without a proper typing desk or table, professional or student typists would sit on cushions or thick telephone books. A type of desk whose name applies to a wide range of forms: At one extreme there are desks furnished with a multitude of panels that swing out while stacks of small drawers pop up when a user lowers or extracts the main writing surface or desktop from a closed position, thanks to some well placed levers and gears. At the other extreme are mechanically simple desks like the Wooton desk whose two panels open up separately by hand and whose desktop is also opened in a separate manual operation, without exploiting any gears or levers.